German physician, and professor of diseases of children in the Berlin University; born May 22, 1843, at Ratibor (Prussian Silesia). At the completion of his highschool education at the gymnasium of his native town (1861), he studied medicine in Berlin and Vienna. He was graduated from Berlin University in 1866, and in the same year accepted the position of private assistant to Doctor Traube at the cholera hospital in Berlin; and in 1868 moved to Seehausen, near Magdeburg, where he began his career as a practising physician. Two years later, however, he accepted the post of chief physician in a military hospital in Nordhausen, and at the close of the Franco-Prussian war returned to Berlin, where he practised medicine, at the same time pursuing anew the studies which had been interrupted under the pressure of practical work in different hospitals. In 1881 Baginsky was appointed privat-docent at the University of Berlin; and in 1892 promoted to an associate professorship at that institution. Baginsky has devoted himself to the treatment of children's diseases. He is director of the Kaiser und Kaiserin Friedrich Kinderkrankenhaus, which he founded in Berlin with the assistance of Virchow in 1890. The Berlin Poliklinik für Kinderkrankheiten was also established in the metropolis through his efforts. He is, moreover, the founder and editor-in-chief of the "Archiv für Kinderheilkunde," which he has published since 1880, in collaboration with Monti and Herz at Stuttgart. Besides being an active member of the majority of medical associations in Berlin, he has taken a leading part in every movement toward promoting the welfare of children in the Prussian capital, and belongs to a number of medical societies, both in Germany and abroad. His services have been repeatedly recognized alike by the Prussian and foreign governments, and he is the recipient of many orders and decorations. His numerous contributions to the science of medicine include treatises on school-hygiene, "Handbuch der Schulhygiene, "Stuttgart, 1883; and on the cure of children's diseases, "Lehrbuch der Kinderkrankheiten," Berlin, 1892 (these latter have been translated into several languages); "Practische Beiträge zur Kinderheilkunde," Tübingen, 1880-84. All of these works have gone through several editions. Among his other writings, besides a great number of papers scattered through several medical journals, may be mentioned: "Pflege des Gesunden und Kranken Kindes," Stuttgart, 1885; "Das Leben des Weibes," ib. 1885; "Kost-und Haltekinderpflege in Berlin," Brunswick, 1886, etc. It may be added that Adolf Baginsky is a member of the several associations and committees formed in Berlin for the purpose of checking the anti-Semitic movement in Germany. He is also the author of an interesting essay entitled, "Die Hygienische Bedeutung der Mosäischen Gesetzgebung," in which he comes forward as a stanch defender and enthusiastic admirer of the hygienic laws of Moses. 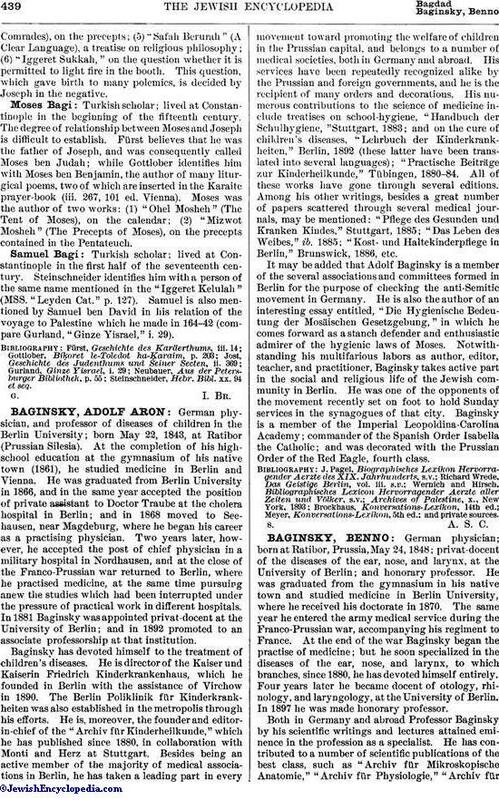 Notwithstanding his multifarious labors as author, editor, teacher, and practitioner, Baginsky takes active part in the social and religious life of the Jewish community in Berlin. He was one of the opponents of the movement recently set on foot to hold Sunday services in the synagogues of that city. Baginsky is a member of the Imperial Leopoldina-Carolina Academy; commander of the Spanish Order Isabella the Catholic; and was decorated with the Prussian Order of the Red Eagle, fourth class. Meyer, Konversations-Lexikon, 5th ed. ; and private sources.